Built for the First National Bank of Red Bluff sometime between 1920 and 1925, the building is significant for its associations with the development of the banking industry in Red Bluff. The building is the finest example of its type and period in the local community. Although a relatively small building, its Neoclassical styling conveys the feeling of monumentality considered appropriate for a banking institution of its period. It is the work of San Francisco architect, William H. Weeks, who designed numerous important public and private buildings during his long career. 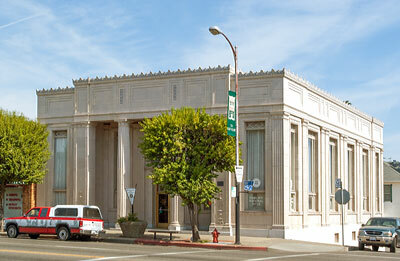 Bank of America occupied the building from 1930 until 1959. From 1959 until 1969, the building was vacant. In 1969, the Daily News moved in and later moved out. In 1994, Fidelity National Title Company moved in and later moved out. Commercial tenants continue to come and go. Adapted from the NRHP nomination dated 27 April 1979.